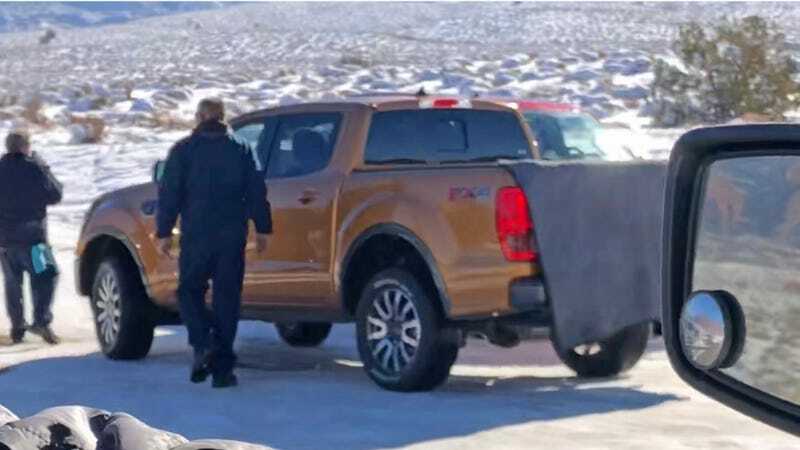 An uncamo’d, production-spec-looking new Ford Ranger was spotted at what appeared to be a photo or commercial shoot in the off-roader’s paradise of Moab, Utah. Now that the 2018 Wrangler has landed, this can be our new 4x4 fixation for a bit. As you can see, this pickup truck’s handlers have made an attempt to mask the vehicle’s identity with a sheet over its tailgate (which probably reads R A N G E R in big letters) but it didn’t fool the Jalopnik reader who sent us this photo. The cab silhouette clearly looks like the current “T6” Ranger sold internationally, and of course “FX4” is Ford’s mild off-road trim level for its U.S.-market truck lines. The truck in our reader’s photo doesn’t have the cab skirts you see on the Australian-market Ranger WildTrak, but yeah, it looks like the same truck otherwise. Interestingly, Ford has told us that the new U.S. Ranger, which is rumored to be dropping in earnest at the Detroit Auto Show next month, will not look like current truck you can already buy outside the United States today. Perhaps the aesthetic revisions are minor. But it’s hard to imagine why Ford would be photographing its new Ranger here if not for the impending U.S. debut. I do believe I see the same style of sunken rear-window opening that the F-150 has. Which is cool, I guess. Anyway, if you’re excited about the Ranger’s return this should be a nice little boost before we shut the door on 2017. And if we’re lucky, the real reveal will happen soon. The 2019 Ford Ranger might just be the first big automotive debut of next year. Hat tip to Mike K!